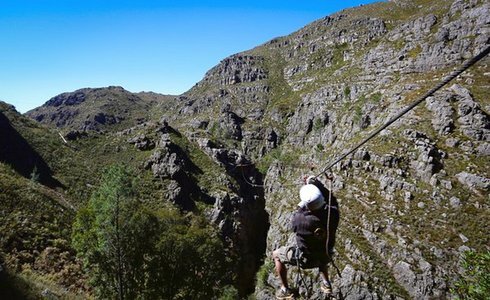 Adrenaline adventure in nature for the enthusiast - a zip line canopy tour in the company of soaring eagles, surrounded by breathtaking Cape fynbos panoramas and mountainscapes only an hour's drive from Cape Town. Thrilled zip liners who have completed the course have described it as super safe. The quality of the structure and equipment is reassuringly high thus allaying safety fears. What to Expect: After a safety briefing and kitting up at the reception, guests will be transported by 4x4 high into the mountain range: this is where the fun begins! Two professional guides will accompany each small group, ensuring strict safety standards, all the while providing an enlightening and educational experience, mentioning interesting facts about the nature and geology of this interesting area. Slide along steel cables from platform to platform, taking you past waterfalls and through valleys, enjoying all that mother nature has to offer. With 13 platforms and slides up to 320m long, both nature and adventure enthusiasts will be sure to come back for more! After a short walk back to the vehicle, we transport you back down to enjoy a light meal together.